During times of environmental strain, such as extended droughts or heat waves, members of Spirogyra switch from asexual to sexual reproduction. Genetic material is exchanged via temporary conjugation tubes established between neighboring strands, or even cells from the same strand, forming an egg-shaped, orange zygospore. The cell wall of the zygospore is thick and adapted to surviving harsh conditions. The zygospore emerges as a new algal strand once the environment is more favorable. Although the green slime floating atop a body of water may appear dirty or polluted, this is not necessarily so. 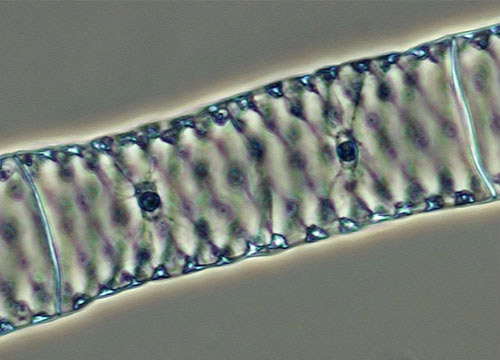 In the full sun of the day, Spirogyra produce a relatively large volume of oxygen, which becomes trapped as tiny bubbles between the tangling strands and causes the algae to rise. At night and on overcast days, the process reverses and the simple plants consume oxygen and produce carbon dioxide as a metabolic waste product of cellular respiration. 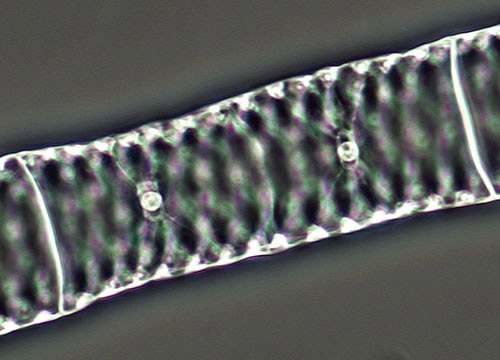 Filamentous algae such as Spirogyra thrive in nutrient rich environments. However, exceptionally large amounts of Spirogyra can indicate over-fertilization of farmlands since excess phosphates and nitrates may contaminate storm water runoff, which, in turn, seep into surrounding waters. When this occurs, wide fluctuations in carbon dioxide and oxygen concentrations can result in rapid changes in the water's pH, causing stress or even death to aquatic organisms such as fish.